Extracapsular . 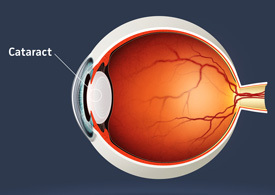 Through an incision about 3/8-inch (10 millimeters) long, an eye surgeon opens your lens capsule and removes the harder, central portion of the lens in one piece. The surgeon then vacuums out the softer parts of the lens. Your surgeon may suggest this method if your cataracts advance beyond the point where phacoemulsification may be effective.